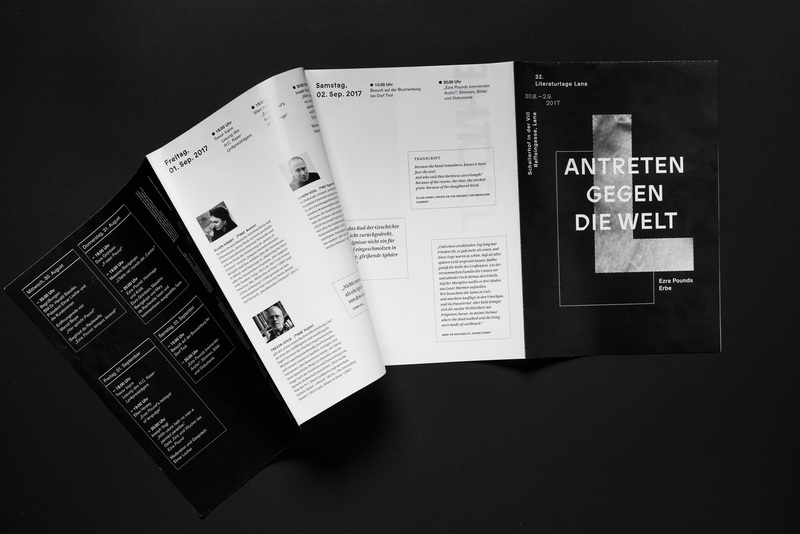 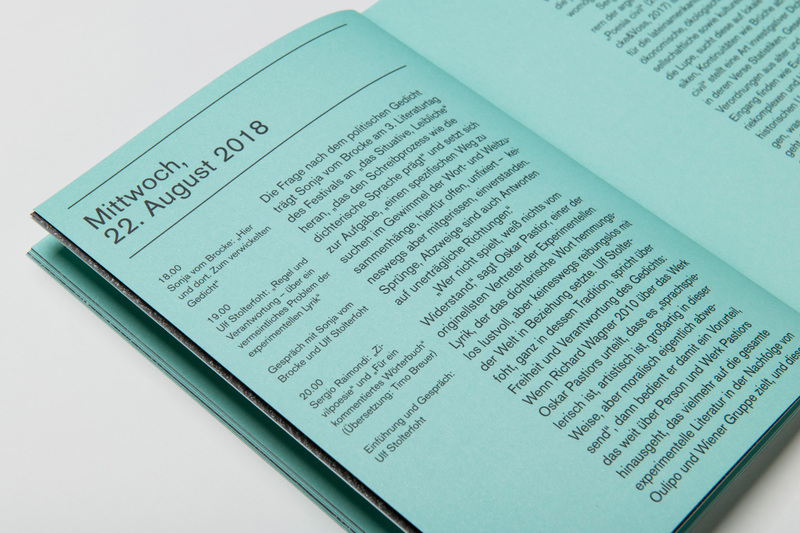 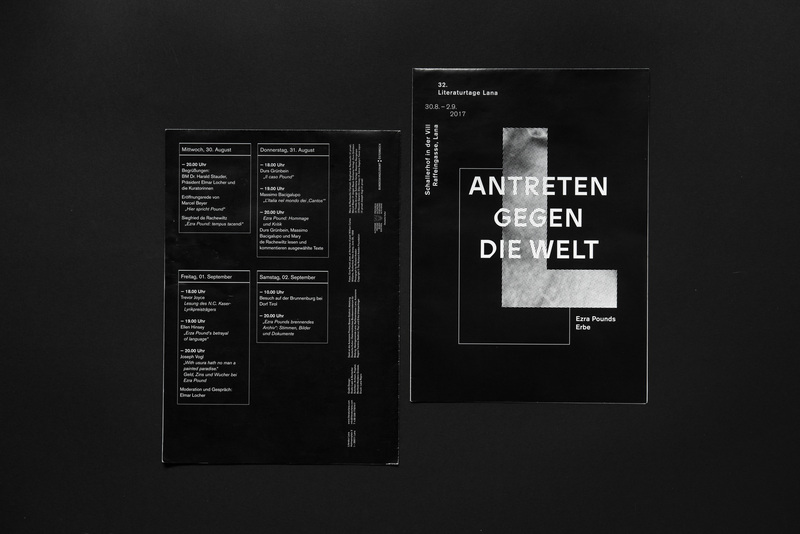 For the annual Literaturtage Lana, each year dedicated to a specific topic, Lupo Burtscher develop visual concepts that tie in with the annual theme. 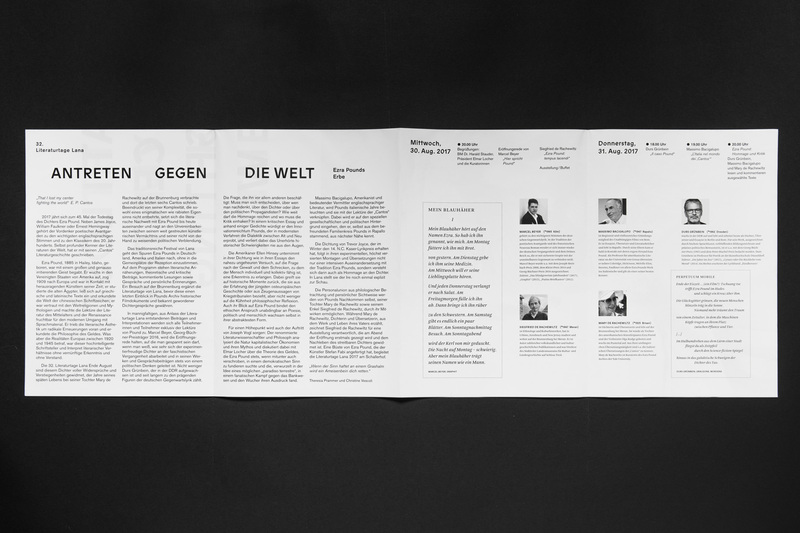 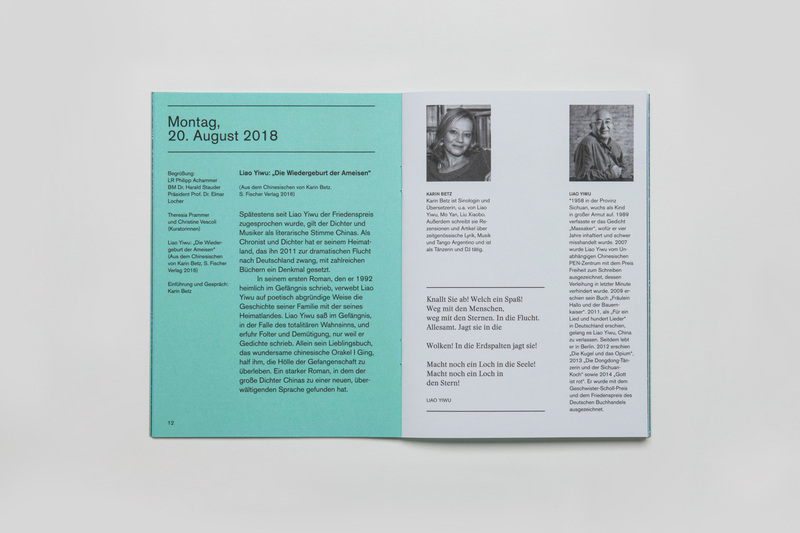 The Literaturtage Lana, organised by Literatur Lana, are a “literary tryst on the fringe of the German-speaking sphere” and give rise to a lively exchange. 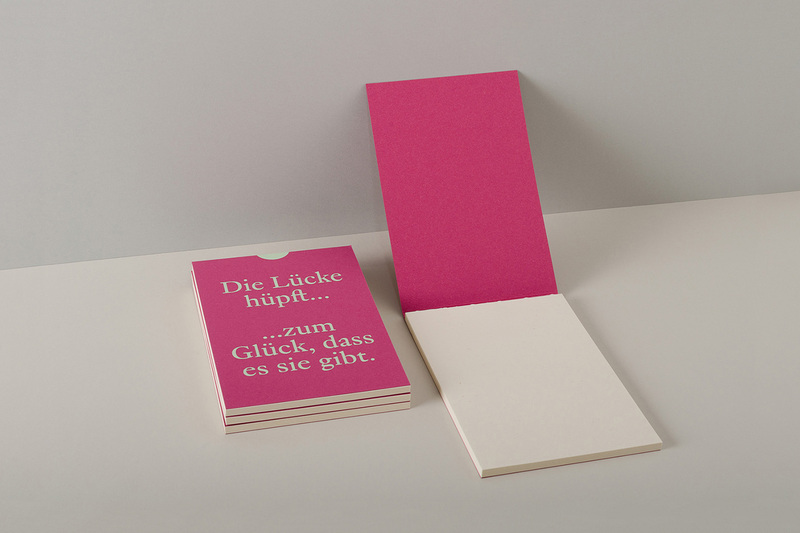 Based on the emphasis of the literature promoters, different communication devices evolve with their own distinctive characteristics, such as note pads, postcards or posters. 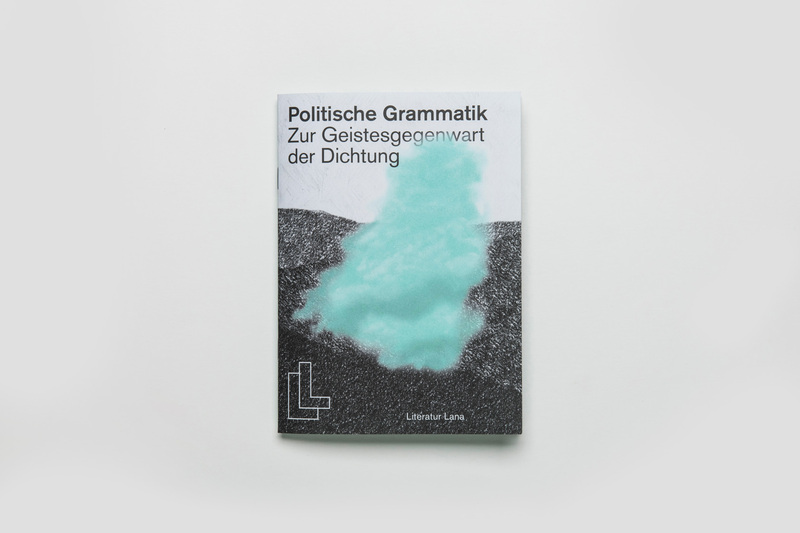 What does political writing mean today? 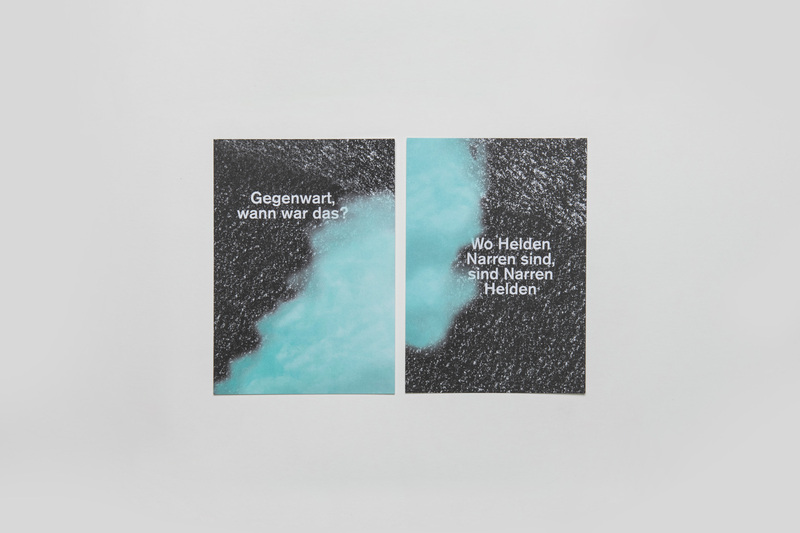 Has there been a paradigm shift from political art to politically correct art? 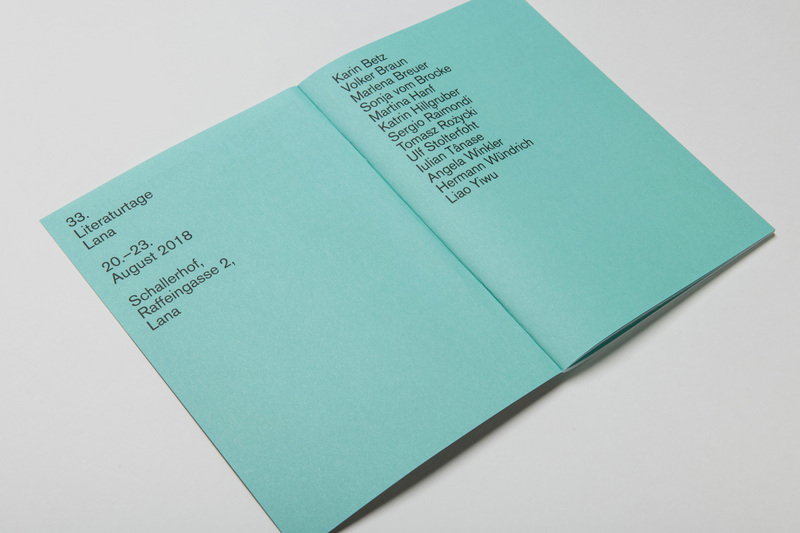 The challenging programme of the thirty-third Literaturtage Lana sets out to answer these and other pressing questions. 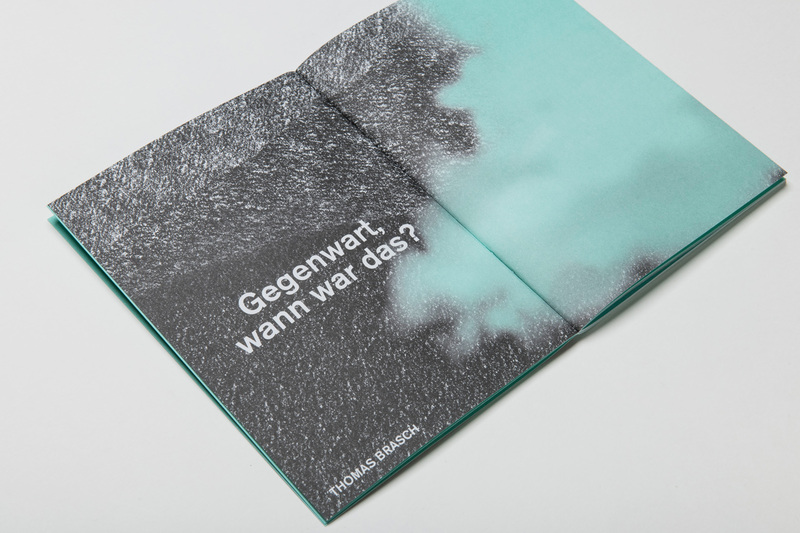 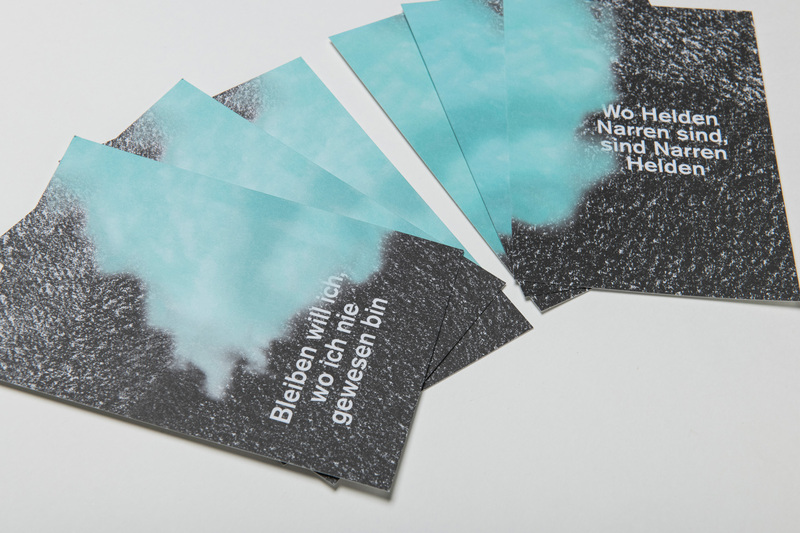 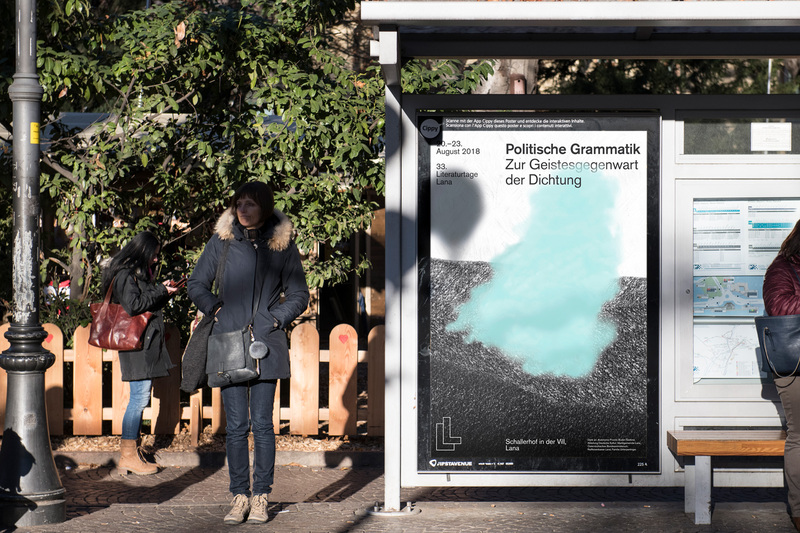 The postcard series, festival booklet, poster and animated gif communicate the theme of the festival through an abstract metaphoric landscape with unclear boundaries under a turquoise cloud of smoke that conceals or reveals depending on its position. 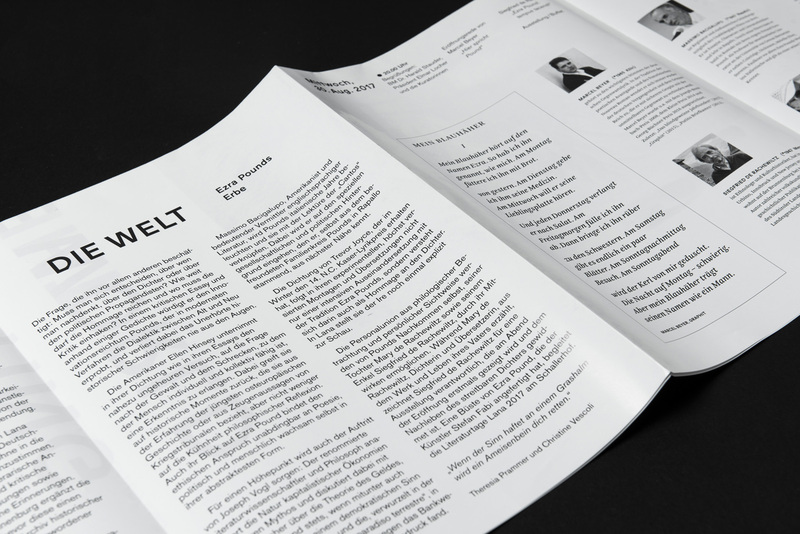 Selected quotations feed the imagination and delineate the theme in writing. 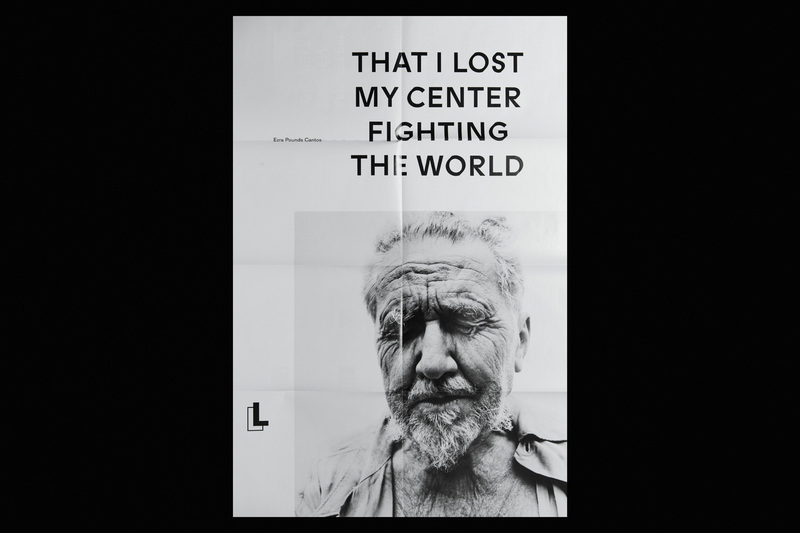 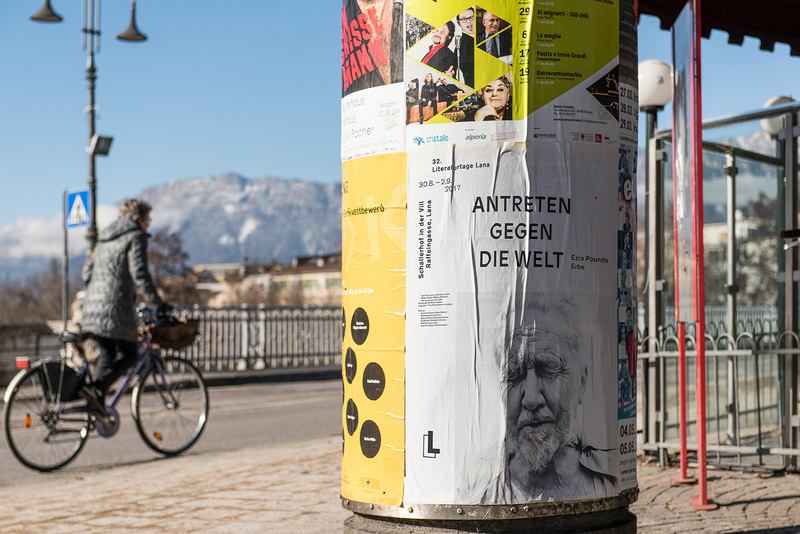 Antreten gegen die Welt is concerned with Ezra Pound’s legacy on the 45th anniversary of his death. 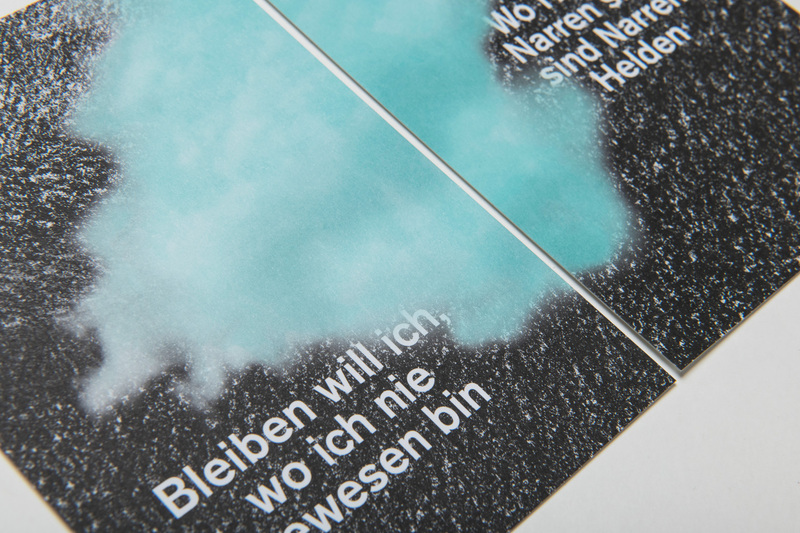 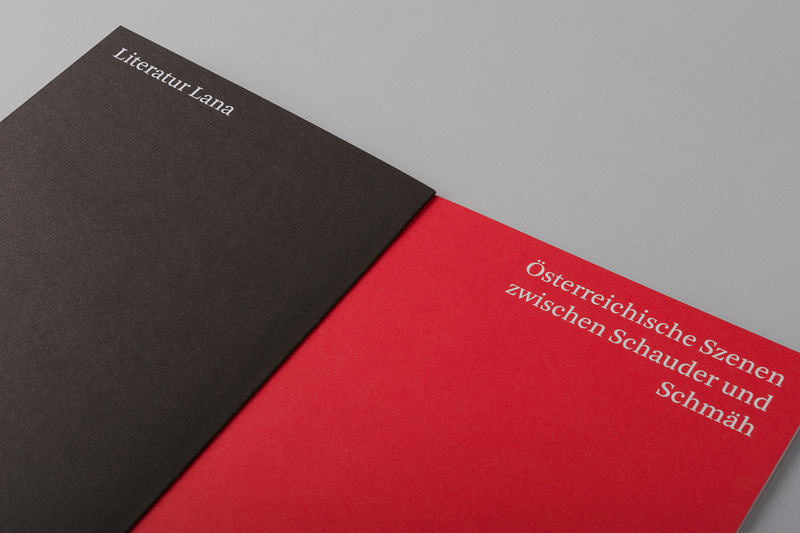 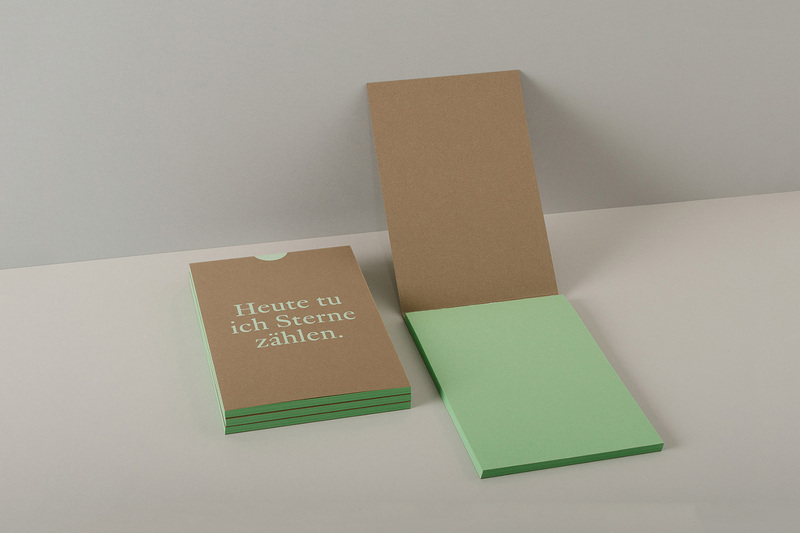 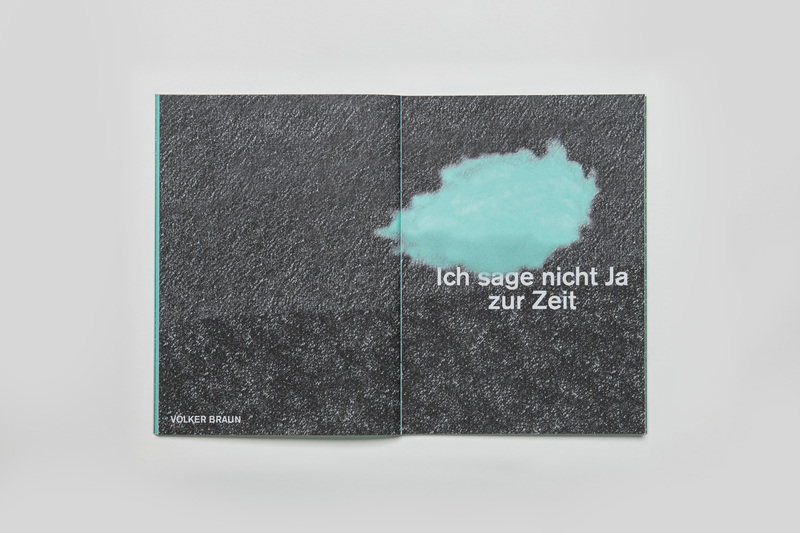 For this occasion, Lupo Burtscher developed a simple poster-folder combination together with a postcard. 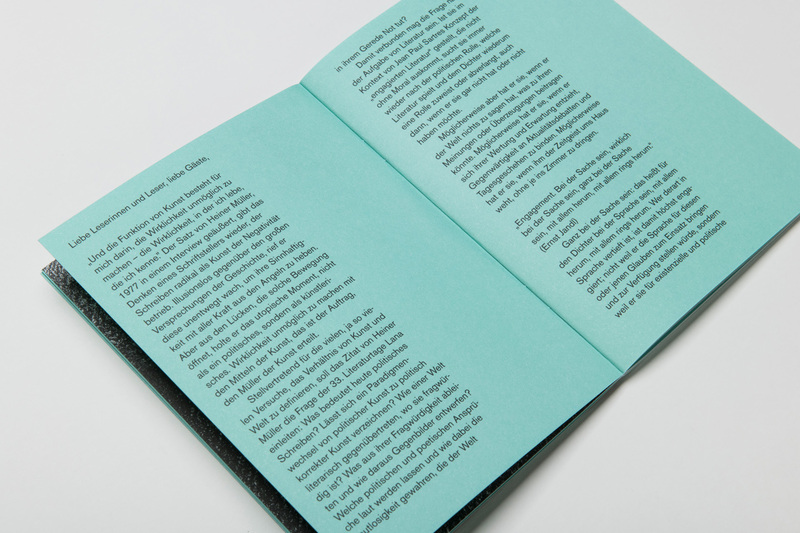 The printed material shows a portrait of an old, tense Pound with his eyes closed. 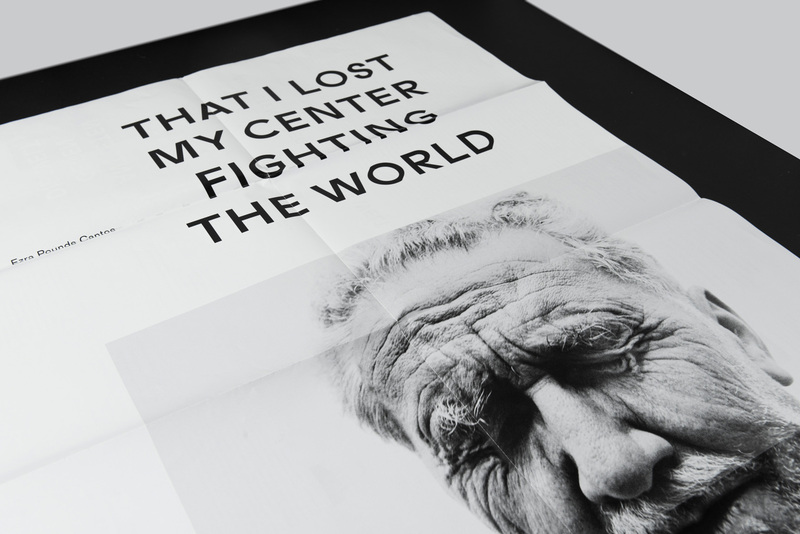 Above it is a quote from his Cantos: “That I lost my center fighting the world”. 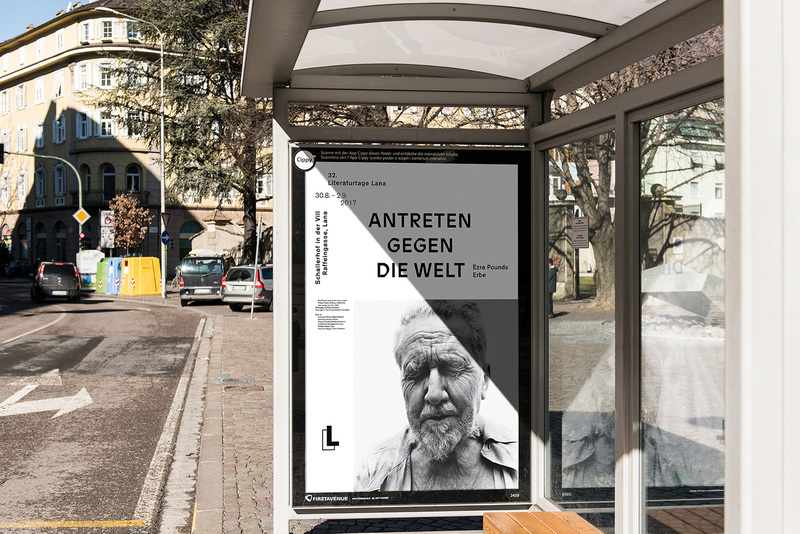 The portrait photo was taken by Richard Avedon. 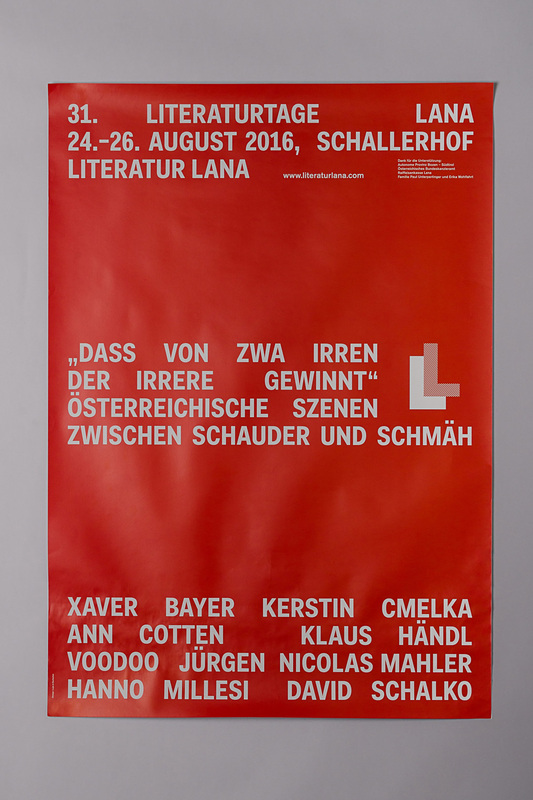 Austrian laughter in all its forms – kind, cruel, impotent, corrosive, uninhibited or outrageous – is the theme of the 31st Literaturtage Lana. 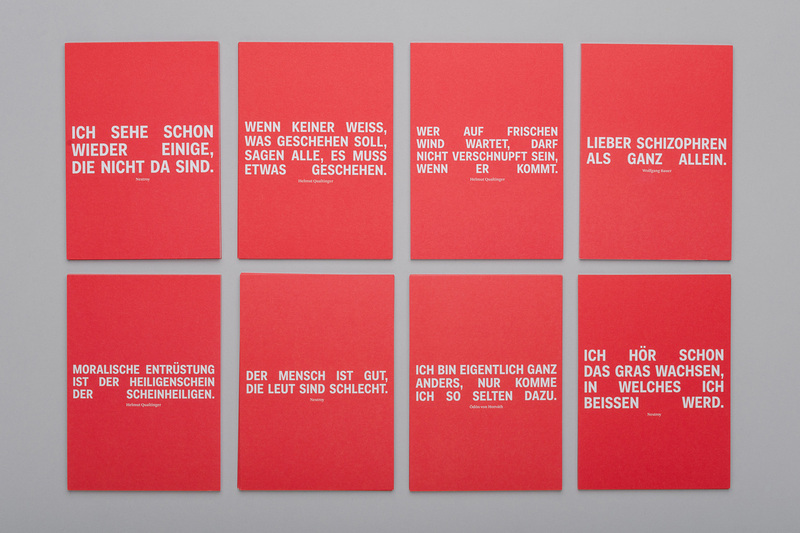 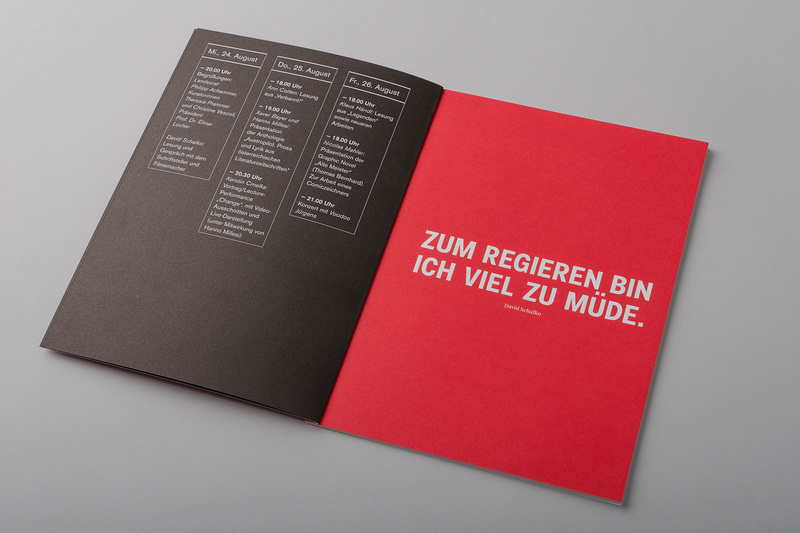 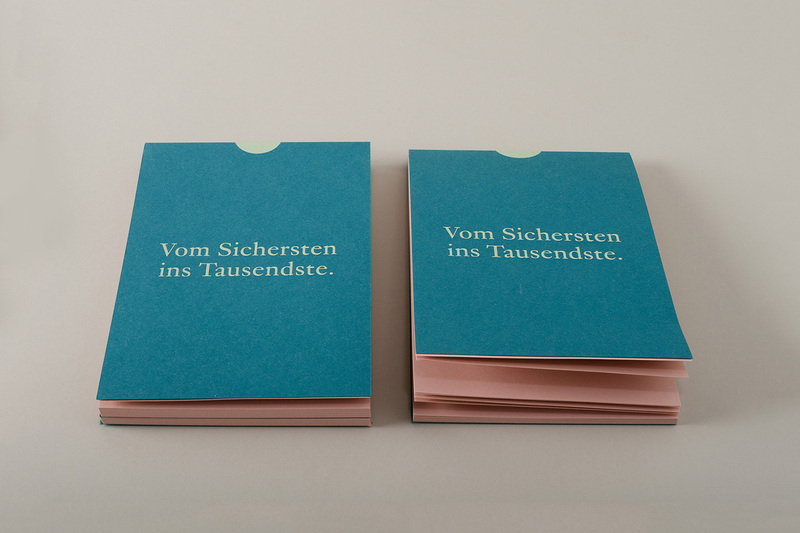 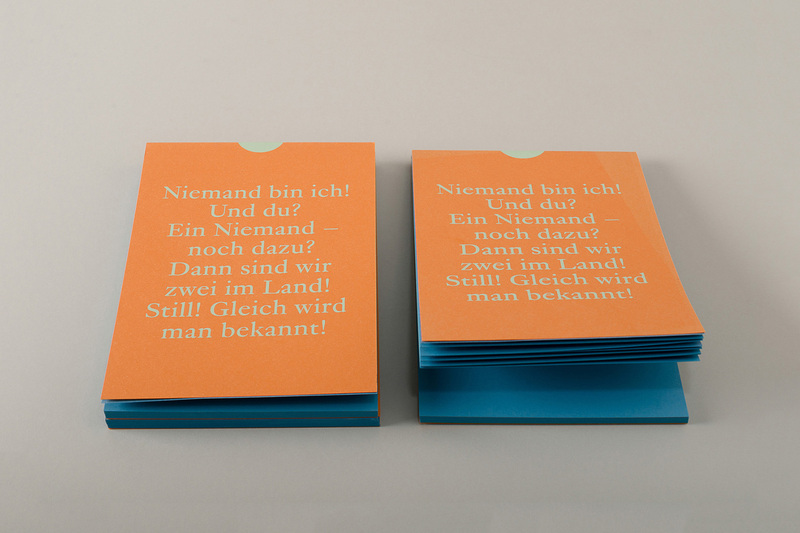 The series of postcards create the Austrian scenarios typographically, running from creepy to contemptuous in red-white-red: Quotes from Austrian authors whet the appetite for more. 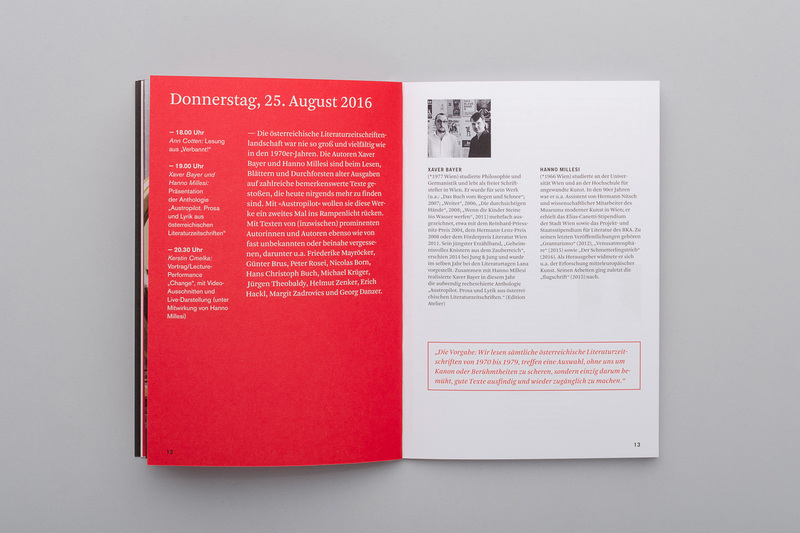 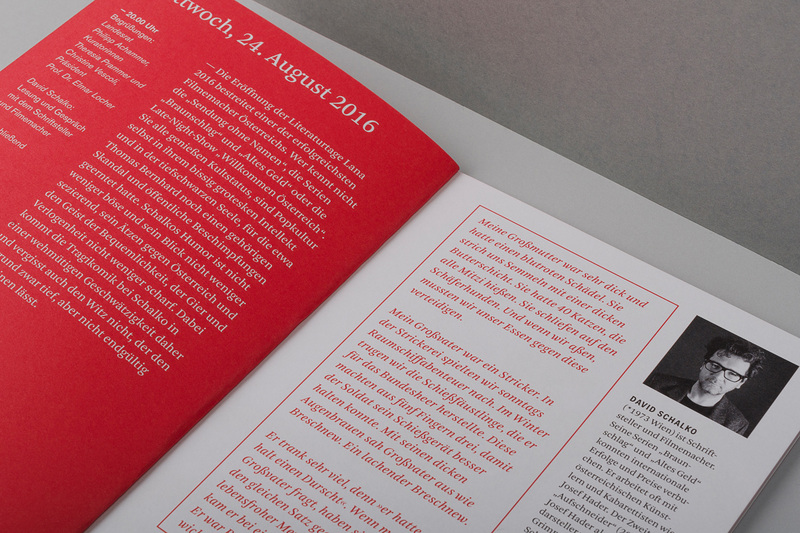 The festival booklet also appears in red and white, with a smattering of black. 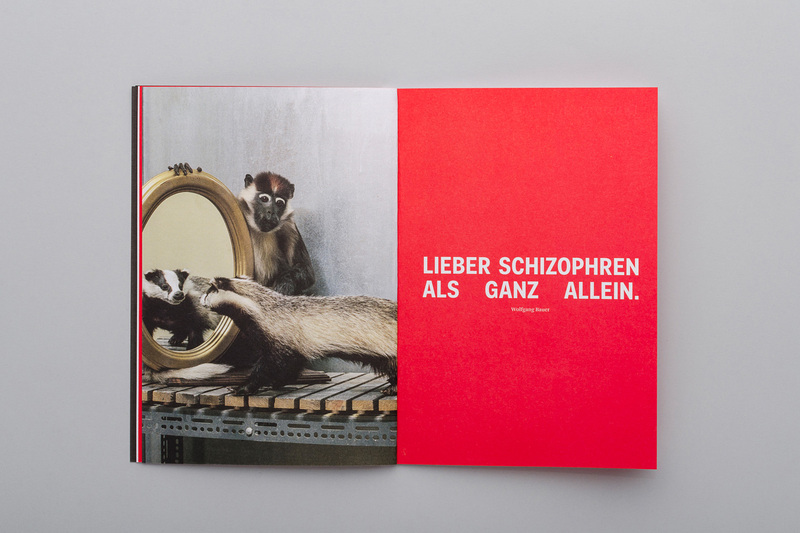 Pictures by Klaus Pichler, interspersed with fragments of text by Austrian authors are found within. 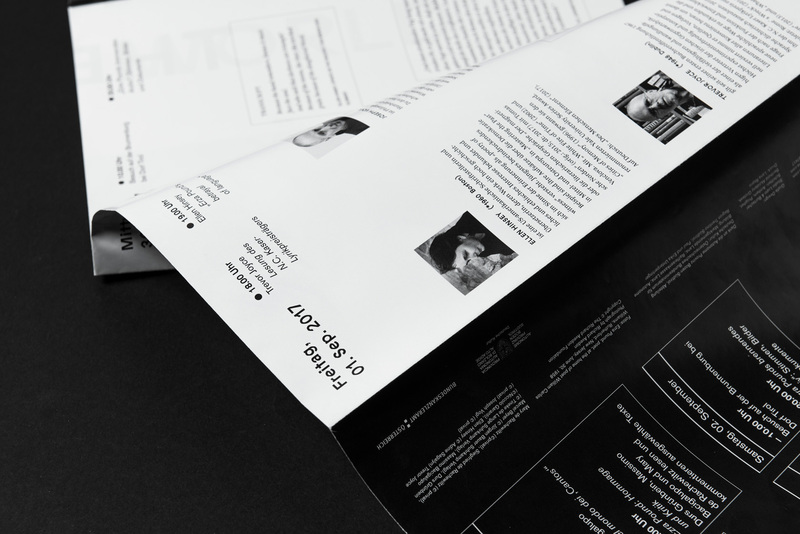 The pages of the booklet are held together by a neatly sewn white thread on the front and back.